The first extruded aluminium mast was made in 1953, in England. Throughout the preceding centuries masts were made of wood or, latterly, of steel; and yet nowadays a wooden mast is considered suitable only for a traditional, gaff-rigged anachronism, and as for steel… Why would anybody build their masts of steel? Then again – why wouldn’t they? Wood is good stuff. It’s wholesome; it’s biodegradable… and it grows on trees. Tall, straight trees of the right sort are ideal for conversion into a sail support, and if Mollymawk were a gaffer she would carry wooden masts. But she isn’t. 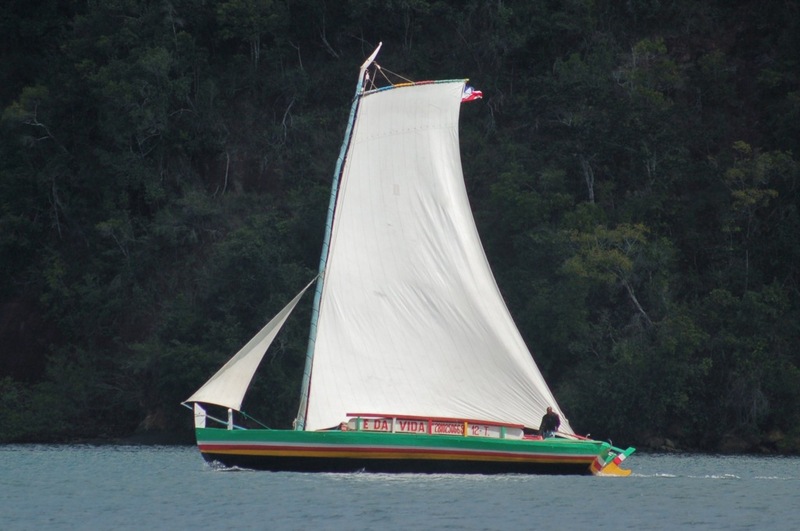 A gaff mast is relatively short and the loads imposed on it by the low aspect sail are relatively small, but Molly’s main mast supports a high-aspect bermudan sail and is 20 metres long (65ft). 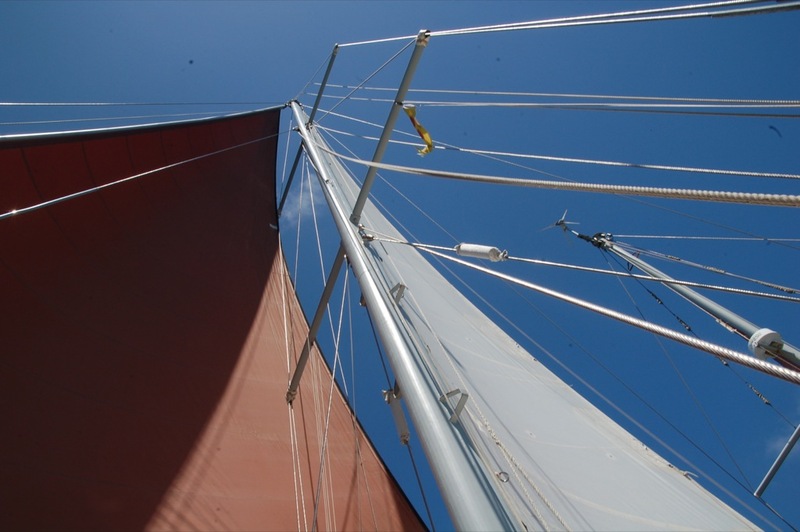 A solid wooden mast 20 metres long would weigh more than twice as much as an aluminium one suited to the same vessel, and this extra weight aloft would make the boat top-heavy and unstable. To get round this problem, sailors of yore gave their racing yachts hollow masts. A hollow wooden mast is a work of art; it is not something that can be thrown together by a man wielding an axe and a chainsaw. It is also a labour of love to maintain; and it is not especially strong. If Nick were a shipwright, and skilled in the matter of working with chisel and plane, then Mollymawk might, perhaps, have hollow wooden masts… but he isn’t; his genius is as a mechanical engineer. Thus it was that when we wanted a pair of cheap masts our attention turned to steel. Why is that you don’t tend to come across yachts with steel masts? To put it another way – what’s so good about aluminium? Scientists had devoted much time, in the preceding century, to trying to get at the elusive mineral and rumours of its potential had been spread abroad. It is said that when Napoleon first got wind of the likely invention he was thrilled. If his soldiers’ muskets were made of this light-weight stuff then they would be able to march twice as far and twice as fast! I guess every new piece of technology is greeted in this way, with the self-congratulatory claims of scientists being enthusiastically applauded by an uncomprehending populace and eagerly grasped by power-hungry politicians and by others who can use them for their own personal gain. I guess that’s why we have sliced white bread, fondue sets, Teasmaids, and nuclear power stations. It’s light; it’s strong; it’s GREAT for making shiny paint! Aluminium is three times lighter than steel, but in order to match the strength of steel it needs to be three times as thick; thus, the emperor would have been back where he started. Aluminium possesses great initial strength, but it is actually quite brittle. If a piece of steel is continually flexed in the same place it will break – but not for a very long time. A piece of aluminium continually flexed in the same way will break fairly quickly. Think about it: you can easily bend, flex, and break an empty aluminium beer can, but it is almost impossible to tear apart an empty steel baked-bean can. This is one reason why aluminium booms break (fairly frequently) at the place where the kicking strap attaches. It is also the reason why aluminium masts generally break at the hounds or in the middle of the lower panel, where pumping and flexing are at their maximum. Such breakages are often exacerbated by electrolytic corrosion – which brings us on to the next little drawback: aluminium is fairly low on the Scale of Nobility. Aluminium doesn’t rust, but if you park it alongside a more “noble” metal and you get the two of them wet and salty, then the aluminium will be degraded. In effect, you will have set up a battery. The seawater will serve as a conductor and your aluminium cleat or spar will gradually be deposited on the stainless steel fastenings. Moor your aluminium boat in a marina and it will be in danger of depositing itself on the steel supports for the jetty. When we capsized our ketch, every aluminium fitting with the exception of the booms was broken; and the only reason that the booms were not broken is that they were not in use. The wind was somewhere in the high sixties or the early seventies, and so we were sailing under storm jib alone. Every other aluminium fixture besides the booms was destroyed when the boat went over. The sea snapped or tore out every aluminium deck fitting. It trashed and removed virtually all trace of the aluminium-framed sprayhood (dodger). It broke the meaty-beaty aluminium cleats and fairleads. It buckled the aluminium track which held the companionway hatchboards in place. Most significantly of all, it broke both of the masts. The mizzen mast was folded in half at the hounds and then lopped off at the top of the tabernacle. 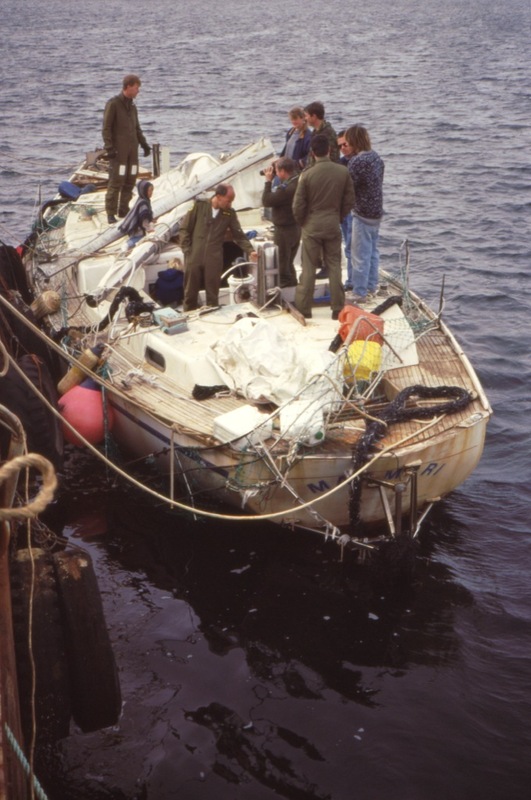 The main mast was broken in three. None of the rigging failed. Every stainless steel stay and every bottlescrew (turnbuckle) was still in place when the boat came up again. Compression alone was responsible for the damage. Would wooden masts have been snapped by the wave? Hollow ones probably would have been, but not solid ones, I think. Would steel masts have buckled? The main argument against the use of steel masts is that steel is heavy. But, as we have seen, steel is also three times stronger than aluminium. In theory, we could have fitted our new boat with a main mast which weighed much the same as a suitable aluminium spar but which had a very much smaller section. 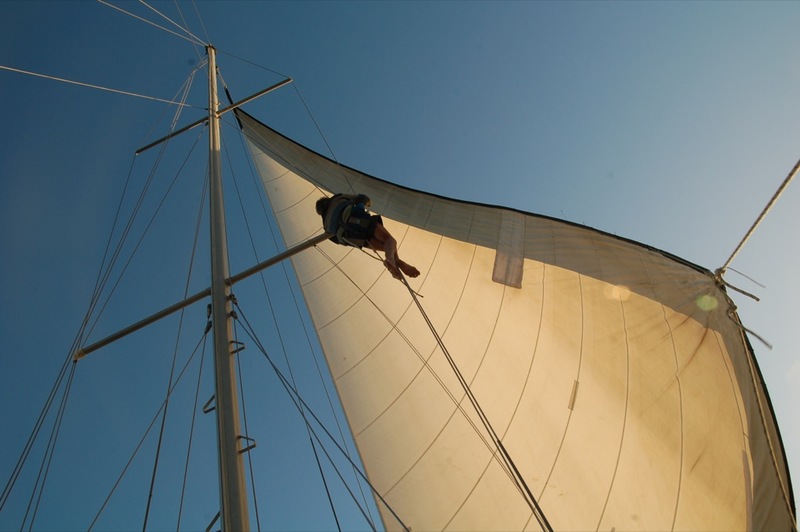 A smaller section has less windage and causes less disruption to the air flowing over the mainsail. 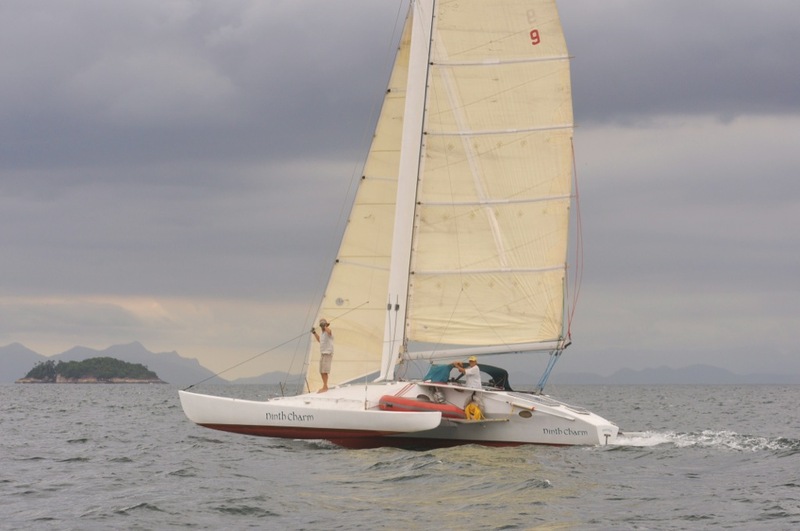 A big section can make as much as a third of the sail wholly ineffective upwind. When push came to shove, however, such a mast would probably not be up to the job. A narrow tube with a fairly thick wall is not so resistant to compression as a fatter one with relatively thin walls. So – how about a relatively fat tube with thin walls…? 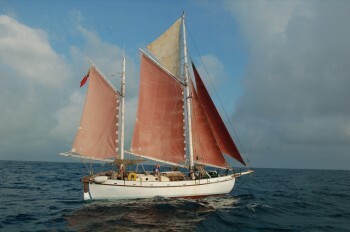 Mollymawk’s main mast is heavier but far stronger than an aluminium spar. Erring on the side of caution and safety, Nick preferred to provide Mollymawk with masts of a reasonably broad section with reasonably thick walls. The result was a design for a main mast which would be somewhat heavier but also much stronger than its aluminium counterpart. To be exact, our main mast weighs in at 728 lbs (330 kg), making it about 30% heavier than a suitable aluminium spar. 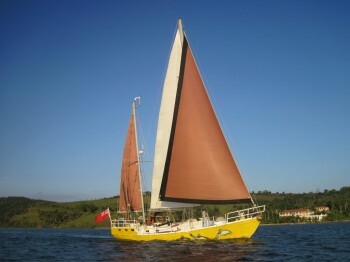 The solid wooden main mast on this Colin Archer type Venus weighs the same as Molly’s main mast. At first glance this 30% weight gain looks extreme, but in fact the weight of a rig is not only derived from the masts; one also has to take into account the rigging wire. When this was added into the equation Nick discovered that the total weight of the rig was actually only 15% heavier than it would be if we used a conventional aluminium extrusion. For what it is worth, the mast on its own weighs almost exactly the same as the solid wooden main mast of a 42ft gaff-rigged Colin Archer. And a sealed steel tube is more buoyant than a wooden pole of the same weight. The tangs, spreaders, mast-steps, and so forth also had to be designed. Having decided upon a suitable size for the mast, the designer then had to invent the various fittings which would aid in its support. 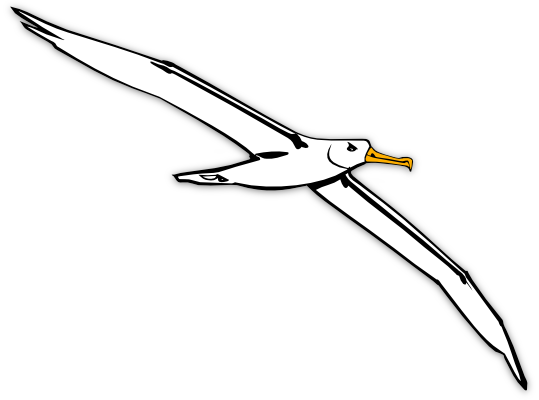 Rigging tangs, hounds, and spreaders – these all must be able to cope with the considerable forces subjected by a wind-filled sail. In view of our recent experience in the Southern Ocean, we were keen to make sure that they were ultra-super-strong, and so – again – Nick erred on the side of extra metal and of safety in numbers. The perfect shape for a mast is an aerofoil section, like this carbon-fibre and wood laminate. So, did we really lop down a couple of lamp posts while no one was looking? No. 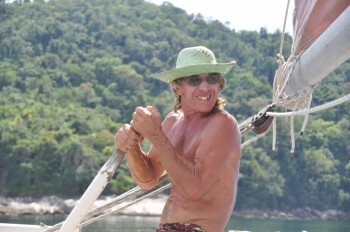 Alas, the lamp posts in the vicinity where we built our boat were made of concrete. More to the point, steel lamp posts are generally round, whereas the ideal shape for a mast is a round-fronted but flat-sided section. The starting point for our masts was a pile of flat steel plate. Cut the steel plate into suitably sized pieces and place them, one at a time, in a ruddy great plate-bending machine. (Ask a technician to help you.) Wallop the plates hard until a dent of the appropriate angle is created. Then move the plate around and do it again; and again; and again. In the fullness of time, and after much noise, the pieces of plate will have been converted into U-shaped gutters. Take the gutters and carefully weld them together, staggering the pattern so that each horizontal join abuts onto the middle of the opposing gutter. Here’s one that I made earlier. It was unfortunate that the manufacture of the main mast coincided with the sandblasting of the hull. We would have much preferred for it to occur when that great undertaking was well astern, but the negotiation of a discount price with the firm who owned the plate bender had involved agreeing to their timescale. Since they were just about to go broke they wanted to get on with the work straight away. We had intended to have the gutters hot-dip galvanised before they were welded together, but in the rush and confusion this, too, was overlooked. We did remember to do it while making the mizzen. 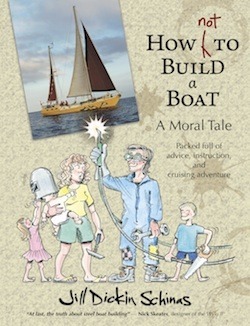 Nick fetched the main mast home on a dinghy trailer… (therein hangs a tale) – and the finishing touches were applied in the paddock, alongside the boat. Another, very long story might be told concerning the means and manner whereby the mast was raised aloft, after the launch… but it will keep for another day. When first installed the mast was supported only by ropes. 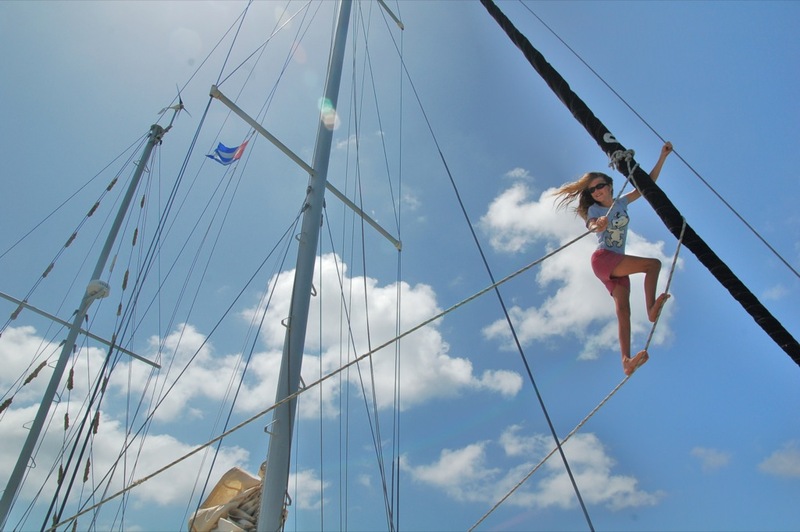 Ropes are almost sufficient to support a gaffer’s mast… but they won’t do for bermudan rig. Before we could go anywhere we needed to replace those guy-lines with heavy-duty stainless steel rigging wire. Fortunately we had some to hand… (I’ll tell you about it some other time) – and we also had a fine collection of hand-made rigging terminals and bottlescrews (turnbuckles, in American-speak). These fittings were not Yachts-and-Yachting affairs. In their previous life they had helped to support a circus tent, of sorts. The rigging wire was not held inside the terminals by swaging, or by any kind of funky metal cones; it was glued there. Well, that glue had held the tent up; and the same type of glue is used to fasten the hook onto the end of a crane’s cable. It’s called Socketfast, and it’s a kind of non-shrink epoxy. We reckoned that if it was good enough for the pros then it was probably good enough for the likes of us. And so it has been. 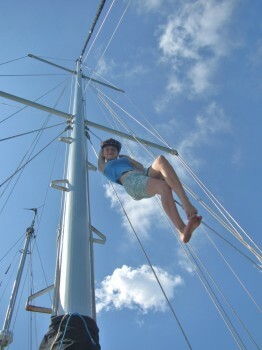 The only piece of rigging wire which is not fitted with one of these home-made, glued-on terminals is the stay which supports the roller furling genoa. Because it needs to be capable of easy removal we fitted this wire with a Norseman of the appropriate size – and this is the only terminal which has ever failed… thus far, touch wood, fingers crossed etc etc. Happily, Mollymawk is equipped with twin forestays. That numero uno criteria, of no single stay being vital, may have saved the mast from falling. In any event, it certainly saved it from being unfairly stressed. 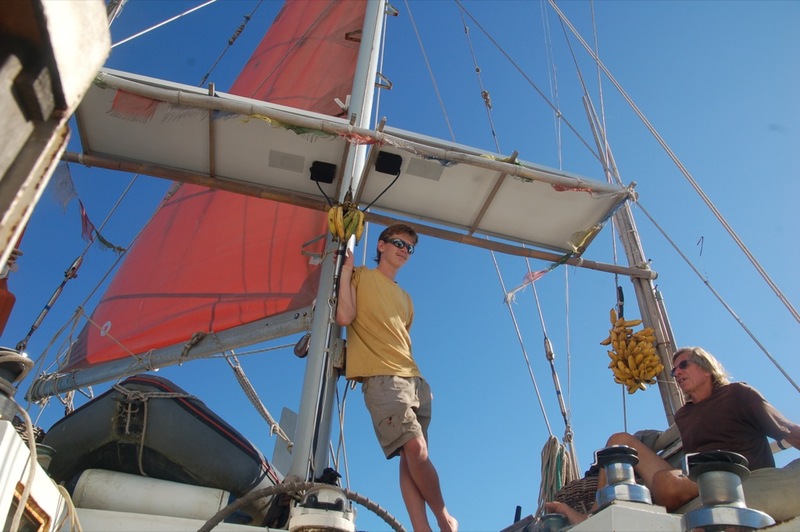 We’re very pleased with Mollymawk’s DIY steel masts – and, indeed, with the rig as a whole. 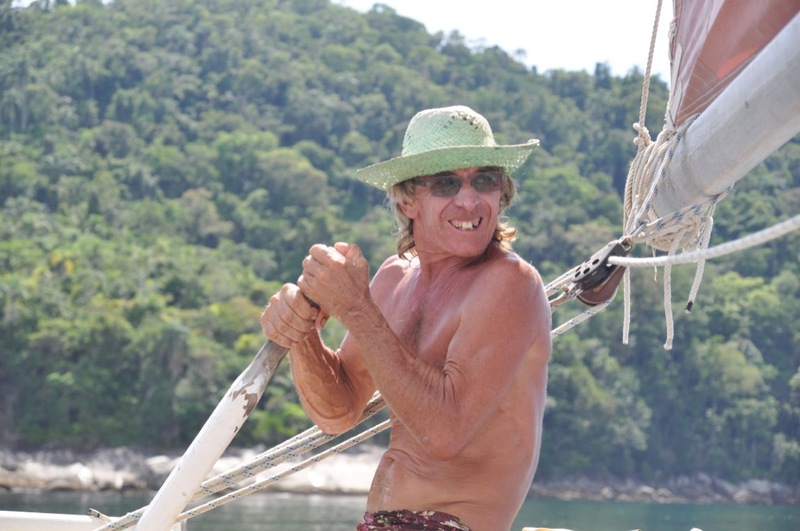 Like pretty much everything else on the boat – from the steering system, to the engine transmission, to the sail plan – it was designed by our celebrated, distinguished, and eminent skipper. If anybody out there wants to commission the design of anything similar, for their own boat, he would be very happy to hear from them. Just drop us a line using the contact form. The full story of Mollymawk’s construction is told in How NOT to Build a Boat. I would be very interested to know what you did for a sailtrack. Bolting one on as you might with aluminium or wood is surely inviting hidden corrosion…? Also, have you had any corrosion problems with the masts in general? 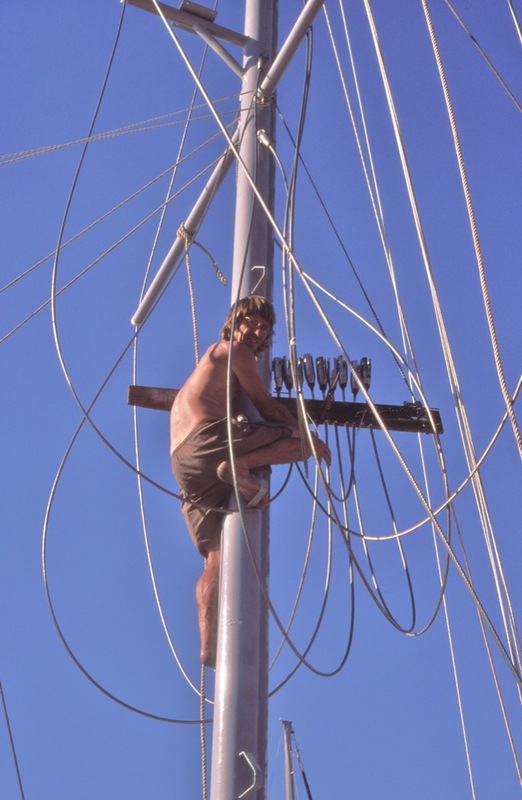 We bought some metal “channel” – the kind of stuff intended as a wiring conduit – and welded that onto the masts. The sail-track is aluminium and it is riveted onto the channel. Another possibility would have been to use stainless sail-track and weld it straight onto the masts. Using the channel we killed two birds, so to speak, because it IS actually also used as a conduit for the wiring (for the nav lights, wind generator, etc). We’ve not had any serious problems. As I think I’ve mentioned in the article, we have had a problem with the main mast track coming away from the channel. 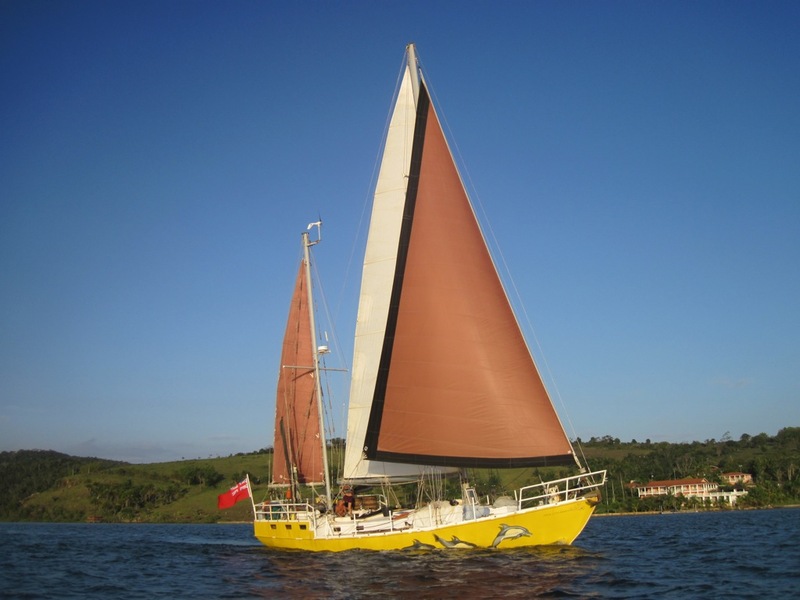 This was partly because we used aluminium rivets – (we couldn’t get monel ones) – and partly because our very powerful fully battened mainsail was supplied with an insufficient number of slides. We’ve now re-riveted the track (and again, we couldn’t get monel rivets…) and we’ve doubled the number of slides. This seems to have solved the problem. As for corrosion – There is some corrosion on the mast steps and on the welds affixing them to the masts. After twelve years that’s not surprising… but if we were doing it again we would use stainless for the steps. All in all, we’re very satisfied with the design and construction of the masts. In fact, I would say that they’re the most successful part of the entire project. There – now that I’ve said that they’ll probably fall down….. Thanks for answering my question. The channel/aluminium track sounds like a really neat solution, and as you say also solves the problem of a wire conduit. Is the channel stainless steel…? It’s good to hear that corrosion hasn’t been as bad as I would have expected, there is a lot of misinformation out there about mild steel in boats, mainly from people who have never used it! It’s nice to see someone challenging the status quo of spending vast amounts of money on ‘yachtie’ equipment. As a simple sailing enthusiast I like the idea of being able to fabricate my own masts on a budget from basic materials… production by the masses rather than mass production and all that! The channel is mild steel, but we had it galvanised. If we’d known how successful galvanising would be we’d have galvanised a few more bits and pieces of the boat! As you say, we like to challenge the idea that boat equipment has to be shiny and expensive and must come from a pukkha manufacturer. A friend once told us a nice story about Robin Knox Johnson. They were sailing some kind of fancy racing machine and the fancy hydraulic preventer broke. How is the Socketfast holding up? Any trouble with fittings or wires coming loose?